Tuvan Orchestra of traditional instruments takes part in the All-Russian Contest among Ensembles and Orchestras of National Instruments which is held every ten years. This time it takes place in Saratov. Tuvan musicians won the right to perform in the final on behalf of the whole Siberian region 2 years ago at a zone stage of the contest which took place in Krasnoyarsk. But their trip to Saratov was under the question till the very last moment as they could not find the whole sum of over 200 000 rubles for the transport expenses of 28 musicians. The Ministry of Culture which initially rejected the first financial pleas of the zone prize-winner saying: 'Why do you want to go there? They do not give money prizes just diplomas', gave at the last moment the needed 131 000 rubles and supplied artists with the new concert dresses. The rest of the sum was collected at a charity concert given on the eve of the departure by other musicians in support of the orchestra. 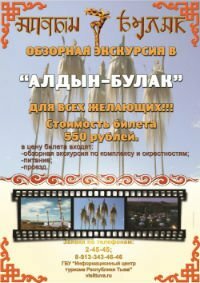 The hugest donation of 50 000 rubles came from shaman Ai-Churek Oyun.